Dr. Bryan and Denise White married in 1996. They reside in Texas where they’ve raised four children. Their eldest, Amber, is married to Robert Bean and they live in Grants Pass, Oregon. Andrew is a sophomore at U.T.A. and the twins, Thomas and Jennifer are in high school. Now they will be dividing their time between Texas and Oregon. Craig Camp is a veteran ﬁne wine professional with more than three decades of experience in every facet of the industry including importing, exporting, distribution, marketing, sales, viticulture and ﬁne wine production. He has extensive hands-on experience in wineries in Italy, Napa Valley, the Willamette Valley and now the Applegate Valley. Camp is an industry leader in the use of online marketing and Social Media. He has been recognized for his online work by Food and Wine Magazine and Saveur Magazine. He is a past vice-president of the Board of Directors of the Rhone Rangers. He also served on the board of the Howell Mountain Vintners and Grower Association and Napa Valley Vintners Association Marketing and New Media committees and is past chairman of both. He came to the Applegate Valley to work in a region on the cutting edge of fine winemaking and is passionate about biodynamic winegrowing and winemaking in Oregon. Steve Hall, while a veteran winemaker, is always driven to push himself and his wines to ever higher levels of complexity. With a résumé that's filled with famous wineries including Robert Biale, JARVIS, and Clos du Val along with a string of highly rated wines from The Wine Spectator and The Wine Advocate, Steve is bringing a new level of sophisticated and thoughtful winemaking to the Applegate Valley. 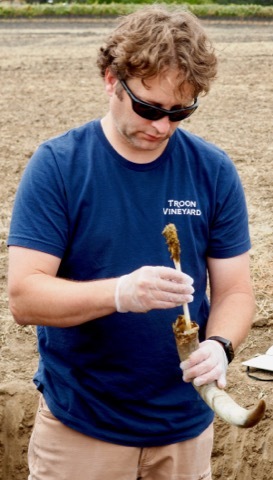 Steve is always focused on building layers of texture and aromatics throughout each of our Troon Vineyard wines. Since his arrival he has been guiding Troon Vineyard towards a natural winemaking philosophy that is guided by our soils and the unique micro-climates of the Applegate Valley. Finesse, definition and complexity are the elements expressed in the wines he crafts at Troon Vineyard. Nate Wall comes to Troon after almost a decade of making wine in the Willamette Valley, and several more years in Virginia. Nate found his calling making wine only after first getting a bachelors in molecular microbiology and a masters in environmental engineering. This grounding in science and sustainability lead him to embrace natural winemaking and biodynamic vineyard practices, and is what drew him in to joining Team Troon as the assistant winemaker. Nate loves the sheer beauty of Southern Oregon, and is excited by the region's unique terroir and potential to craft distinct, memorable and honest wines with a true sense of place. He is thrilled to have the opportunity to be a part of this vibrant wine industry as it continues to grow, and develops into what must soon be recognized as one of the world's preeminent wine regions. Meg found herself at home in the Carlton Troon Wine Bar over 5 years ago and has continued to grow her knowledge and passion for wine and hospitality. She loves hosting people from all walks of life and from all over the world in the Carlton Troon Vineyard Tasting Salon in the heart of the Willamette Valley. She also loves being able to spend time at the winery in the Applegate Valley at the winery continually learning and growing. Meg has been on the Board of Directors of the Carlton Business Association for the past several years, helping to introduce people to this destination in wine country. Bringing the hand-crafted wines of Troon Vineyard to the northern part of the state is a joy! Before Nate found himself as Sales Manager, he developed his personal and relationship skills through various life experiences. Nate was born in the bay area of California and moved around a lot by the time he turned twenty-one. He was involved in a lot of team oriented sports and activities growing up, which led to an easy transition when the time came to join the military. As a U.S. Army Paratrooper he learned discipline along with attention to detail can make all the difference. With a new “work for the person next to you” mentality after the service, he’s translated that into a natural way of providing comfort for others. His last couple years were spent managing the Troon Vineyard tasting room, in the cellar learning the production and winemaking, and now as Sales Manager. His new home being just a couple miles from Troon Vineyard provides a relaxing yet motivational environment that has definitely captured his attention!